A sighting system as mission adaptable as you are. 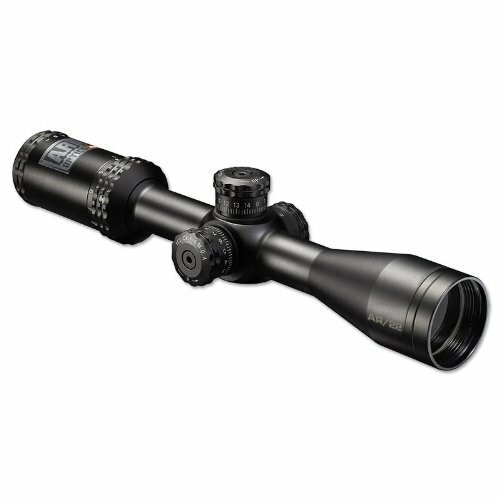 The Bushnell AR Optics 4.5-18x 44mm Bullet Drop Compensating (BDC) Reticle riflescope with side parallax focus features target turrets for pinpoint-precise adjustments, plus caliber-specific reticle to deliver every round with peerless accuracy. Drop Zone-223 BDC reticle is calibrated for 55-62 grain, 223 REM/5.556 loads. Zeroes at 100 yards, with aiming points out to 500 yards. Fully multi-coated optics for incredible brightness, and fast focus eyepiece deliver maximum accuracy and reliability. Nitrogen purged to remove any vestige of internal moisture, and O-ring sealed to prevent the entry of dust or moisture. Made of high-durability aluminum alloy, anodize-finished and sealed to protect the inside from elements. Riflescope is rustproof, virtually scratchproof and a beautiful complement to even the most expensive AR platform firearm. Please note that the scope’s erector cap assembly (located on the bottom of the scope windage and elevation control housing) may limit the possibility to use extra-low or low scope rings on AR Optics riflescopes. Most commonly, medium height rings provide the clearance necessary to eliminate contact with the cap and the scope base or receiver on most firearms. Please check the clearance necessary on your individual firearm prior to selecting scope rings.